Want to access your PC anytime, anywhere, but don't like throwing money away to an always-on system? Now, with a few easy steps, PC in My Hand will help you realize your ideas: boot and control your system remotely from internet use your any mobile devices when you need it. Available for iPhone, Android, BlackBerry, Windows Mobile/PPC, Nokia/Symbian, Palm, ipad or other Notebook and more. mobile device. PC Administration. Access Restrictions. Password Protected Access. Handy Invoice is an easy to use invoicing application for your small business. Why limit yourself to 1 temperamental copy of Windows? Clone a few more be safe! 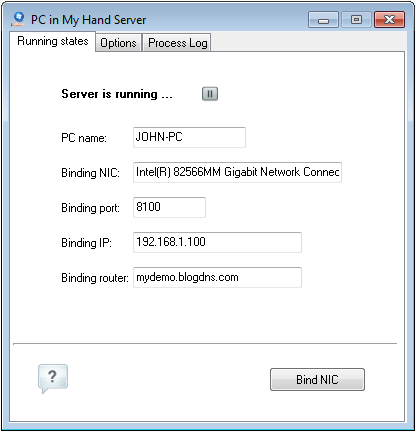 Remote control your PC at logonmypc.com even if both sides behind firewall. Easy to use freeware finger and day time client, doesn't require installation. My BUG FREE PC will repair every error on your PC anytime you need it. It breaks new ground in design and functionality! Qweas is providing links to PC in My Hand 1.20 as a courtesy, and makes no representations regarding PC in My Hand or any other applications or any information related thereto. Any questions, complaints or claims regarding this application PC in My Hand 1.20 must be directed to the appropriate software vendor. You may click the publisher link of PC in My Hand on the top of this page to get more details about the vendor.